I made a wish and it came true. 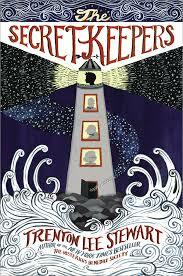 Trenton Lee Stewart finally graced the reading public with a new title, The Secret Keepers. I heard about this title a few months back and pre-ordered my copy on Amazon because you do know I love The Mysterious Benedict Society (linked to my ravings), right? It's quite simply the best middle grade fiction series in modern history. It really is. My hopes were astoundingly high that I would love The Secret Keepers just as well. Now, I am aware that that sort of a attitude is quite a dangerous one to have towards a book, but I'm relieved happy to say that all of my expectations were met. Any fan of The Mysterious Benedict Society is highly likely to be well-pleased with this latest title. The Secret Keepers is a standalone novel about a young boy named Reuben who lives with his hard-working, single mom. Reuben is largely left to himself due to the fact that his mom is working two jobs to try to keep them afloat. (His father died when he was young.) One day Reuben comes across a rather extraordinary antique watch which has a mysterious ability to turn people invisible. This watch is highly prized and, as Reuben discovers, highly sought after. He first believes that the watch might provide a little extra cash for he and his mom but quickly discovers that this watch is not some magic trinket good for a month or two of rent. Danger lurks everywhere and Reuben finds himself on an adventure that he didn't quite bargain for. This story is your basic good vs. evil type of story. There are good guys and bad guys and some you have to spend some time with before you figure out whose side they are really on. Reuben is the main protagonist but along the way he picks up a few friends who prove that their friendship and assistance is absolutely crucial to his well-being. The chief question that I think the book asks is if you would choose to be courageous even if and/or when you are scared. What will fear drive you to do? I love this question! I love it because, of course, we all face things that terrify us in our lives. The idea though is not to run away from our fears, but to face them. Courage, as "they" are want to say, is not the absence of fear but doing the right thing regardless. This message being wrapped up into a Stewart-esque story just makes it all the more engaging and enjoyable from my perspective. One of the reasons why I love Trenton Lee Stewart's writings so much is that he isn't out to make a point with his stories; rather, he is out to tell a good story. He is so focused on telling an intricate tale that draws the reader in and captures their imagination, that truth and beauty naturally flow from his storytelling mouth. To put this another way: Stewart is about the business of telling a story, and along the way he occasionally raises an interesting question for the reader to think about. In comparison, most other modern authors are so interested in making a point that the story begins to takes a backseat. The point that they wish to make becomes the whole issue of the book to the detriment of story, a fact I find distracting. I love that Stewart cares more about developing as a writer and crafting a good tale than bludgeoning his reader to death with a personal agenda. Of course Stewart has a worldview; everybody does. But it's not obvious and on its face like much of what you see published today. There wasn't a single character that I did not grow to love in this book. I'm halfway afraid to confess that because it sounds like I was set-up to love this book from the words, "Written by . . . " and there is some truth to that! I was going to love it. I would have been some level of devastated if I didn't. I love his characters though because they slowly unfold. Stewart isn't in a rush to tell you this story. He takes 501 sweet pages to allow you get to know the people, their motivations, likes and dislikes, hopes and dreams. I knew from The Mysterious Benedict Society to expect surprises all the way to the end of the book and, although there are no shocking revelations at the end of The Secret Keepers, there is plenty of guesswork to keep the reader interested in what is happening. "Drop everything. Buy this book. Read it." Thank you, Mr. Stewart, for giving me (personally - heh) another book to love. I know this title just came out but I'm hereby putting you on notice that I'm waiting for your next work. It can be a series if you want. Or, really, whatever you feel like. I'm a little unclear as to whether I should mention this or not but the copy I read was sent to me by L-B Kids Publishing for review purposes. I wasn't expecting it to come. As I mentioned at the beginning of my review, I pre-ordered my copy off Amazon. However, I did read the first solid book that showed up and that was the one from L-B Kids. I received no additional compensation. (In fact, I wasn't expecting the book at all!) All opinions expressed in the above review are entirely my own. I mean, if you doubted . . . I have 3 "middle grade" readers who will be thrilled to read this book. They devoured The Mysterious Benedict Society series this summer, so I have no doubt they will love this one as well. I'm excited to read this one... and now even more so after hearing that it has received your approval! Great review, by the way! How do you have this already?! I'm so jealous! @Stephanie - I was also sent a copy for review purposes (which arrived first, obviously) from L-B Kids Publishing. I debated whether or not to mention this because I did purchase my own copy. Hmm. Maybe I should have. I might re-edit my post to say so. I was offered a chance to read a Netgalley edition which I didn't accept because I wanted to read the actual book, held in my hands. I wasn't expecting a copy to show up (as I had declined the other alternative) but\, all the same, it did come and since I could hold it in my hands, I read the first copy which arrived in my mailbox-- the one from L-B Kids. I loved every word of the MBS books, but I did begin to get why people say he's a big long-winded. I thought it got so much better when he had another child with whom he could relate, and that didn't happen until over 130 pages in! Somewhere I saw this book as The Secret Keepers series, I THOUGHT, but I'm not sure. It stands alone, but we could definitely see more of these characters, I think!